A grim chord played in a minor key and sustained for the length of a novel, Emily Brontë’s Wuthering Heights is equal parts compelling and oppressive, a near-relentless depiction of the hell people make for each other when love curdles under the heat of disappointment. Brontë’s novel easily supports distant, Masterpiece Theater-inspired takes and lent itself beautifully to a 1939 William Wyler adaptation starring Laurence Olivier and Merle Oberon, but any stately approach takes the roundabout route to the book’s dark heart. Andrea Arnold’s new adaptation eschews any niceties, opting for handheld camerawork, unfettered emotions, casual brutality, and flashes of piercing beauty. 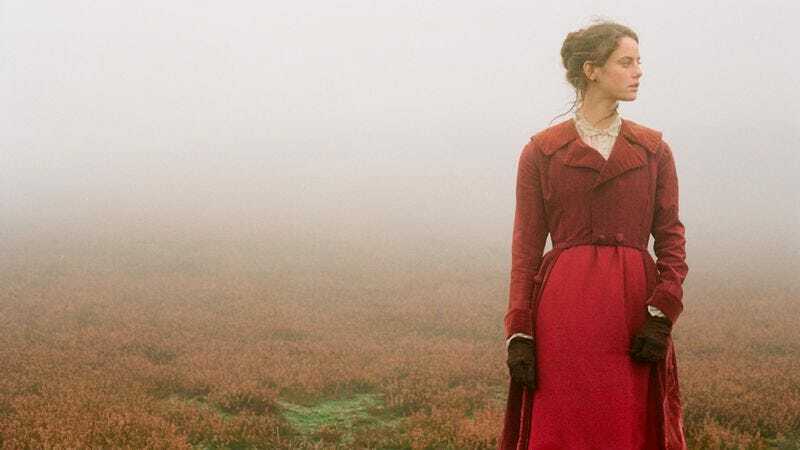 Shot in the Yorkshire moors that gave the book its setting, it’s an intense, uncompromising take that restores some of the shock that made Wuthering Heights so notable when it first appeared. That would be true even without the most obvious liberty Arnold takes with the text, pushing Brontë’s description of Heathcliff as “a dark-skinned gipsy in aspect” even further by casting black actors in the part. Solomon Glave plays Heathcliff—a foundling of unknown origins, taken into a Yorkshire home that already has its share of discord—as a boy just on the edge of adolescence; James Howson takes up the role as an adult just on the other side of it. Their Heathcliffs are paired, respectively, with Shannon Beer and Kaya Scodelario as Catherine, a girl from Heathcliff’s adopted family. Initially, they’re inseparable; then he becomes obsessed with her. Their love, however, is not to be, and in time, his frustrated desire festers, threatening the lives of some around him, and claiming the happiness of even more. Making Heathcliff’s race the film’s sole focus would risk turning the casting into a stunt. Instead, that detail becomes the logical extension of the character’s otherness in the novel. Here, racial slurs join the other insults heaped upon him, contributing to the resentment that leads him to try to take what’s denied him—or, failing that, have his revenge. Arnold captures the intensity of Brontë’s prose with restless camera work and performances so intense that the film feels almost voyeuristic at times. She stages the drama against scenes of nature both pitiless and beautiful. In the opening scene, Howson, in a private moment, sulks, cries, and contorts his body in rage, while outside, the wind causes the branch of a tree to tap insistently at a window. It isn’t a question of whether the glass will break, but when. In Arnold’s version, the flimsy boundaries of civilization do little to keep out the insistent wildness, and the line between humanity and nature is never that well defined. The characters live side by side with animals, rut in the fields, and die giving birth in the same. Wandering the moors, they get lost in the landscape, and Arnold’s framing often emphasizes their insignificance amid miles of forbidding beauty. That contrast makes Heathcliff’s rebellion all the more remarkable, though no more heroic. Arnold conveys the sense that he’s turned not just against a community, but against the natural order of things, demanding to be satisfied in a world that promises no satisfaction, one capable of overwhelming beauty, but inclined to keep that beauty out of reach. Given the choice of rage or resignation, he chooses the former, and Arnold’s film follows the cues of his stormy soul. It’s sometimes hard to watch. There’s a frankness to its farm scenes—animal lovers should go in forewarned—that sets the tone for the way its characters treat each other. When Heathcliff and Catherine are children, their eyes lock as they wrestle in the Yorkshire mud, and the film turns that moment into the beginning of a long, tortured fall from grace portrayed with uncomfortable intimacy, and, in the final scenes, taken to a grim conclusion that threatens to turn the movie into a horror film. It’s an unexpected take on Wuthering Heights, one made all the more powerful, and no less faithful, for its unconventional choices.